Occasionally the blonde bombshell from Mattel’s other iconic brand, Barbie, crosses platforms and finds her name on the side of Hot Wheels vehicles. 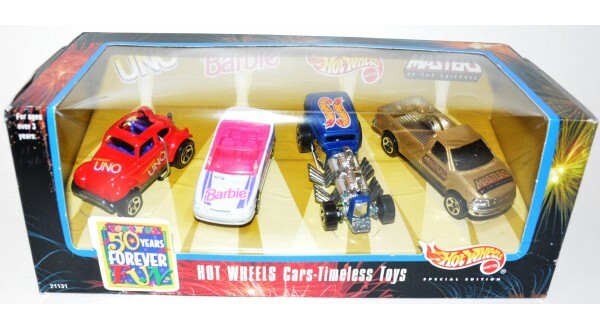 From 1998-2000, Hot Wheels released the Timeless Toys 4-car sets exclusively at Toys R Us. Each car in the set featured a different Mattel brand. Its not clear as to the reasoning behind these sets other than the cross-promotional function. Reason aside, we got 3 nice box sets out of it (including 3 Barbie vehicles). Barbie has always had a good taste in vehicles, and the ’96 Mustang Convertible & ’97 Corvette follow that notion, however the Dodge Caravan in the 3rd set suggests a more family-oriented Barbie. Good for her and Ken. Lets take a moment to focus on the ’97 Corvette from the 2nd set. 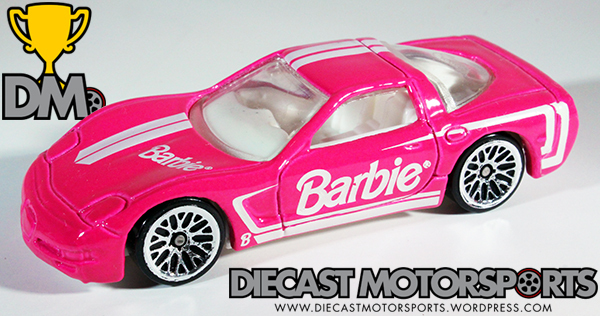 This C5 Corvette is done in a metalflake “Barbie” pink, this Corvette looks great all the way through in its white racing stripes and Barbie insignia. The notion of pink Hot Wheels always makes a release that much popular due to the rarity of pink cars in the redline era–pink cars were made in lesser quantities because they were thought to appeal to only girls. Here’s a collecting tidbit: collector’s love pink cars. I tend to attribute it to that old redline era notion of limited quantities = collectibility, but who knows, there just may be a lot of collectors out there that enjoy the color. While this one is not rare by any means, it is very collectible and when I come across it at a local show, it usually gets snatched up by the end of the night. Online, as a loose car, it has been selling well as the last few on eBay have gone anywhere from $8 to $15-shipped. So grab this one while you can as it may not be as common in the near future. RELEASE DETAILS: Metalflake Pink Body (metal). Clear Windows. White Interior. Chrome Wire-Spoke (WS) Wheels. White Base (plastic). Made in Malaysia. Toy# 16668. 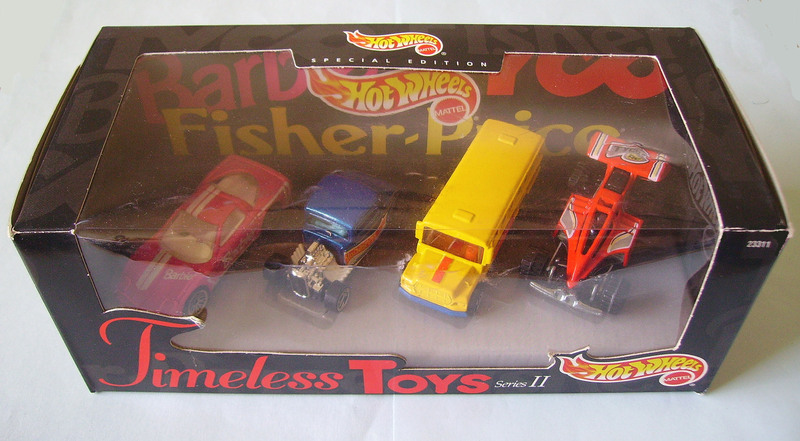 Released in 1999 as part of the 4-car Timeless Toys Series II set sold exclusively at Toys R Us.